Comprehensive editorial feedback of your book's plot, structure and readability. Clear, actionable advice that will allow you to create a better book. Extensive multi-page editor's report, which will highlight and explain the big problems within your book. Benefit from our editorial experience. Edit returned within 28 business days. We understand publishing timeframes are essential and will provide a delivery date before the editing starts. We use a simple pricing system based on the cost per 1000 words. The price we quote is fully inclusive and will be the price you will pay to get your book edited. There are no hidden costs. The price includes all editing, consultation, and after-edit care. Ramona Flightner, author of the Banished Saga. David Papini, author of The Taste of Emotions. We will return your manuscript within twenty-eight business days (counting Monday-Friday) or roughly five calendar weeks. We are a small and dedicated team. We pick the best editor for each job. We have professional editors and robust quality-control systems. We can’t rush the process. If you submitted and paid today, your feedback would be returned no later than June 01. Our unique book editing service will provide the feedback you need to lift your book to a publishable standard. Combined developmental and line editing will provide the guidance you need to identify and correct any problems within your book. Our process is focussed on you, the writer, and you remain in control at all stages. We have transparent communication, which will keep you informed at every step. We also employ tracked changes and embedded comments, meaning that you have full control over what is changed within your book. We will never alter your book's themes, change your voice or enforce any suggestions that revise your vision for your book. Our product provides unrivalled customer service, guaranteed quality, all within an affordable budget. We promise 100% anonymity and will never discuss your book with anyone other than yourself, without your written permission. We have more than 100 testimonials from writers who wish to thank us for our work on their books. Developmental editing is also called content editing, structural editing, story editing, substantive editing, comprehensive editing, macro editing, or even heavy editing. It is all the same thing. A traditionally published author would have had both their agent and publisher provide support on the editorial aspects of their book. However, for the self-publishing author, this feedback must be procured by the book’s creator. Our editing package is designed to offer this support. Our editors will not only look to highlight technical issues but will provide you with a clear road map as to what you can do to fix these issues and how to become a better author in the process. The role of the developmental editor is to ensure that a book is of a publishable standard. Unlike other types of editing, developmental editing is more about the editor's education, experience and gut feeling than following a pre-written manual of instructions. This means that the developmental editor's skill is critical. However, to ensure that we approach every book in the same way, our editors apply a number of questions to each book that they edit. Does the structure of the book make sense? Is there a wider story arc that engages the reader and pulls them through the narrative? Does the chapter structure make sense? Does the writer understand scene structure? Have narrative techniques been correctly applied? Does each scene contain sufficient description? Is each new character sufficiently described? Is the characterization believable and consistent? Are the characters sufficiently developed? If the novel is set in the past, are there any inconsistencies in the use of objects etc.? Does the book's voice, style and format match the genre expectations? Is the writer telling, when they should be showing? Does the book's word count meet the genre expectations? If it is too short, how can it be extended? If too long, what approach should be taken? Has the writer correctly formatted paragraphs? Will shorter or longer paragraphs better suit the style or genre of the book? If a prologue is used, does it match the genre and make sense to the wider narrative? Does the book need an introduction? Does the book need additional end material, such as bibliography or epilogue? Should the writer include information about themselves? If relevant, is the book correctly referenced? If images, tables and diagrams have been used, has the copyright been correctly attributed? If included, are all footnotes or endnotes correctly presented and formatted? The editor will communicate their thoughts, directions and suggestions using embedded comments and the editor's report. When editing your book, your editor will constantly be applying the questions above and will have a collection of thoughts and suggestions that will improve your book. We fundamentally believe that our role is to guide and suggest but the control of the final changes should always remain with the writer. Afterall, you have the clearest vision for your book. One way that we communicate our thoughts and feelings on your book is by the use of embedded comments. These 'comments' are part of Word's editing tools and they will appear automatically when you open up the edited manuscript. If not, then it is just a simple matter of changing one of the settings in Word. This is easy to do. What kind of things will you find in your comments? There are no 'rules' as to what we will and will not include, and it changes with each writer and each book. However, we see these comments as a way to start a 'dialogue' with the writer. They are our way of highlighting a small section of the book and suggesting what might be wrong and what you need to do to improve that section. Comments about consistent sentence-level problems. For example, we might highlight a section of text that we feel needs more description. Comments about wider issues, that are also addressed in the editor's report. For example, we may feel you are telling, not showing. We will add a detailed explanation in the editor's report and then use comments to highlight sections where this problem exists. Comments about words or phrases we feel are not working. Comments about sections we feel should be removed or moved. It is very difficult to generalise since each manuscript is different, but comments are the way in which your editor will show you, at a granular level, where (and how), they feel you can improve your book. However, the comments should not be considered in isolation. In addition, we will also write a detailed multi-page editor’s report. This document will be your editor’s thoughts on your book. It is a broad overview of the key issues and will act as a ‘jumping off point’ when you come to consider the changes to apply to your book. As with the comments, the exact contents of the report will change with each book. However, we have been editing books since 2007, and during this time we have developed a detailed structure for our reports. This acts as a start point when compiling the report. The report consists of two main parts: general thoughts and chapter comments. In the general thoughts section, we will highlight any key issues that have surfaced during the edit. We will explain why we feel that the issue needs addressing, we will provide examples of where the issue is a problem (often in conjunction with the embedded comments within the manuscript) and then provide at least one solution that you can be applied to fix the problem. For example, let’s say that we feel your book is slow to start. There are a number of reasons why a narrative might start slowly. It may be that the writer has included too much ‘setup’, which though they feel is essential to the plot, is actually slowing the pace of the book. It might also be that the writer has not really written the book with any defined structure and the story lacks any kind of inciting incident in the opening section. This would produce a story that has no real narrative drive. It may also be that the writer has simply started the story at the wrong place in the plot. The problem with a slow start is that it leaves the reader feeling disconnected from a story and the writer risks ‘losing’ the reader. If we were editing a book with a slow start, this would be a major issue that we would examine in the editor’s report. Our first job would be to work out why the start was slow and then suggest solutions to fix the problem. This means that in the example above we might suggest one of three solutions. If we felt the ‘set up’ was the issue, we would suggest that the reader reexamines the opening section and looks to remove the set up that is not immediately essential to the plot. We would then discuss ways this set up could be reintroduced later in the book (perhaps via speech or new scenes). If we felt the structure was wrong, it might be a case of trying to enforce a very loose three-act structure. This would provide a natural inciting incident (an event that drives the character to action) and, therefore, give the book a natural narrative arc. If the story has started in the wrong place, then we would provide suggestions as to how the opening section of the book can be restructured. It might be that we feel moving the start of the story to a more significant event would provide a better structure. If this were the case, we’d highlight where we feel the story should start and then provide strategies to ensure that nothing essential to the plot was lost in the restructuring. The aim of the report is to be a document that you can use to understand the issues within your book and how they can be fixed. We never just say 'fix this' but will instead explain why it is an issue and what you need to do to correct the problem. Many authors tell us the editor’s report quickly becomes an invaluable tool. Before each editing session, the author will refer back to the report and get a 'feel' for the bigger picture before delving into the nitty-gritty of the line edit. In addition to the developmental editing, we will also carry out a line edit for your book. 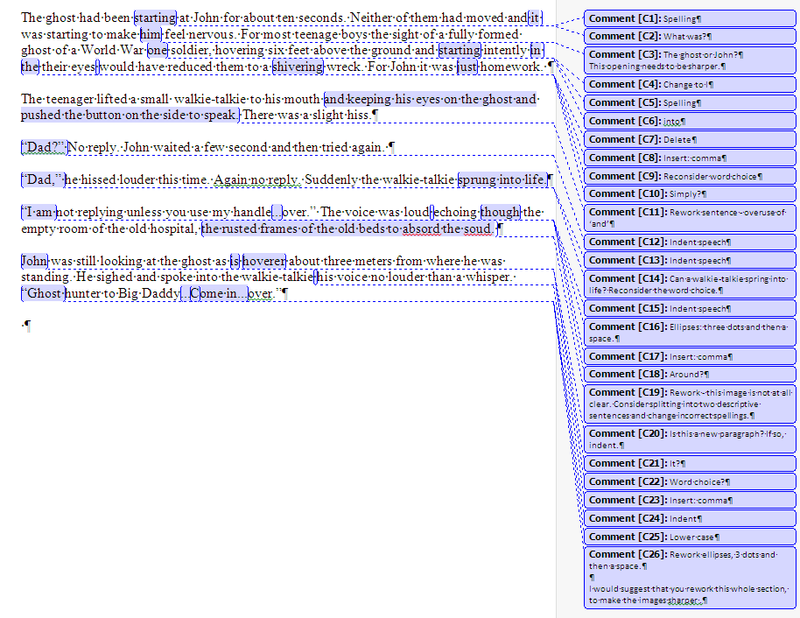 Some people will describe line editing as ‘mechanical editing’. This refers to the rigid nature of the line editing process, which looks to fix errors in the prose to match the strict rules of a style manual. In its simplest terms, the line editing process will involve the editor reading each line of your book and applying the rules from the appropriate style manual. Spell out whole numbers up to (and including) one hundred (e.g., zero, one, ten, ninety-six, 104). Spell out numbers that begin a sentence unless it begins with a year (e.g., "Twelve drummers," "The 10 lords a-leaping," "2011's quota for off-season holiday references has been filled."). The line editing we apply to your prose can be described as ‘light’ line editing. This means that though we will look to find and change every error we can, it is not an exhaustive process. Developmental editing is the primary goal of the edit, and this will be the primary focus of the editor. This means that, though we work hard to catch all errors, it is not 100%. We always suggest to writers that they see the line edit as guidance, rather than a replacement for proofreading. Once we have returned the manuscript, you will have a clear indication of where the errors lie and will then be able to re-enforce our work with your own editing. The developmental editing process will stimulate some level of re-writing from you, the writer. This means that once you have back the edited manuscript, you will be looking to change and add new material. Any new writing will bring new errors; we are all human. What is included in the line edit? The editor will read each line of your book and then when they see an error, they will make a change. This error will be fixed using tracked changes, which means that you remain in control. If you wish to ‘reject’ the change, then it is a simple process of saying 'no' to the change. The process will then automatically revert back to the original text. If the editor sees errors that are made consistently (perhaps incorrect capitalisation of a word). They may choose to apply a global find and replace. This process will see the editor asking Word to ‘find’ each occasion of the error and then replacing the error with the correct version. Find and replace is used with caution but can be a very effective tool in adding consistency to a manuscript. As with all editing, there is a level of ‘art’ to line editing, but on the whole, it is the most mechanical of the editing steps. Edits will use one of four style manuals to decide how to handle the errors and inconsistencies within a manuscript. If you are using American English, the editor will use the Chicago Manual of Style by default. However, they can use Associated Press Style Guide if you have used this manual during the writing process. If writing in British English, the editor will use the Oxford Style Guide. In addition, BubbleCow also has an internal style guide that will be consulted for certain issues. For example, most style guides will suggest that the correct format for the ellipsis is . . . (that’s dot space dot space dot). However, though this is fine for print books, it can cause problems with digital ebook conversions where the ‘white space’ is automatically removed. Therefore, our internal style guide suggests that the ellipsis is best presented as … (no spaces). Additional elements, such as charts, tables, and graphs. Finding the right editor for your project is not easy. The chances are that you have spent months (a recent survey suggested that the average time to write a book was seven months) writing your book and you, rightly, want to make sure that you have the correct person for the job. The first step is to ask us all the questions that you have, which are niggling away. We are more than happy to answer any questions. The next step is to submit your book for a free sample edit. The sample editing process is almost identical to the full editing process. We will look at the opening section of your book, normally the first 2000 words, and complete a developmental and line edit. We will also produce an editor’s report. This sample edit will give you a great indication of not only what we can do for your book, but also what might be wrong and what needs fixing. The only thing we can’t do is comment on wider narrative issues. We need to read the full story before we can make a judgement on certain technical and structural problems. The sample edit will take twenty-four business hours to complete. Once the sample edit is ready, you’ll get an email with instructions on how to download your sample edit. If you have questions about the sample edit, we will be happy to answer these either via email, phone or Skype. The editing process normally consists of two stages: the sample edit and the full edit. The role of the sample edit is to show you what we can offer for your book. If you don’t need a sample edit, it is okay to just jump ahead to the full edit. Click this link to go to our secure sample submission page. Create a free BubbleCow account using email and password. Complete the submission form and attach your manuscript. This will need to be a Word document. The manuscript is submitted to BubbleCow and uploaded to our secure server. A senior editor will download your manuscript onto their local machine and assess the book. If we feel we can add value, the book is ‘accepted’. If we feel we can’t add value, the book is ‘rejected’ and deleted from the editor’s local machine. The first 2000 words of the ‘accepted’ manuscript are edited by the senior editor. They will complete a line edit and a developmental edit. An editor’s report is also completed. The edited manuscript and editor’s report are uploaded to our secure server. An email is automatically sent to inform you that the sample edit is ready. The editor deletes any files from their local machine. The writer logs into their BubbleCow account and downloads the edited manuscript and report. When the writer is ready to proceed, they log back into their account and submit the manuscript for full editing. Additional information is required at this point, and the writer will need to fill out a new form and upload the full manuscript. Once the file is uploaded, a senior editor will download the file to their local machine and assess the book. If the book is accepted an email is automatically sent to the writer. If we feel that we can’t add value to the book, it is rejected, and the writer is informed by email. The editor will delete the file from their local machine. If accepted, an email will be sent with an invoice for your edit and a link to our secure payment system. We work with writers from all over the world, so we can 'bill' you in the currency that is best for you. We use PayPal's secure payment system, since this will allow you to use any major card for payment. You will not need to create a PayPal account. Once payment has been made we will email you with a receipt for payment. You will also be given a date for the lastest possible return of the edit. This will be 28 business days from payment. An editor will be chosen for the book. The choice of editor is based on the editor’s experience in the genre, their desire to edit the book and current workload. In most cases, an editor will express a desire to work with the writer and the project. An editor will be assigned to the book, and they will then be granted access to the online files. The editor will download the files to our Dropbox system, and they will have access to the files on their local machine. The editor will complete the developmental and line edit, producing an editor’s report in the process. Once complete, they will upload the files to the secure server and delete the files from their local machine. A senior editor will access the files via our internal Dropbox system and check that the edit is ready to be returned to the writer. When the senior editor is happy, the files are removed from the Dropbox system, and the writer is informed (by email) that the edit is ready. The writer logs onto their account and downloads the edited files. We see our interaction with writers as a long-term relationship. We want to be with you for the book you are writing now and all your future projects. In addition to editorial support, we work hard to provide help with all elements of the self-publishing process. This might be through blog posts, free ebooks, email exchanges or even one-to-one Skype calls. Once you have worked with us on one book, we will remain at your side to help at every step. Once you have had your edit back, it is natural that you will have questions. We will answer these questions in whatever way works for you. It might be that you want to email us the questions or set up a chat, either way works. As part of the service, you are entitled to a sixty-minute one-to-one chat with your editor. The next step will be for you to rewrite the sections that need more work. This will produce a new manuscript. As a general rule, we don’t carry out full second edits. The reason being that we have already said everything we need to say. However, if you have reworked a particular section, we will be more than happy to have a look at that section and pass comment. If you feel your book has changed significantly from the version we edited, it may be possible for us to carry out a second edit. If we feel that we can add more value a second time, we’ll book you in for a second edit. The charge for this edit is the same as the first. The help will not stop there. One advantage we possess is that we have experience of both traditional and self-publishing, as well as access to hundreds of writers. The chances are that if you are having a problem with the writing or publishing process we have already seen and solved this problem. It may well be the case that one quick email to us saves you a significant amount of time. Tom Savage, author of the Nora Baron series. Kevin Wolfenberger, author of Rise of the Elementals. Do you accept all books? No, but we accept most fiction genres and all major nonfiction genres. In fact, we say yes to about 75% of the books that are submitted. Our goal is to add maximum value to writers. However, for this to happen we have to be the correct editors for your book. The most common reason we will reject a book is that the book is not far enough down the writing process for a developmental edit to be of maximum value. For example, if a book is at the ‘first draft’ stage and contains many very simple errors, we will say no. If a book’s formatting and structure are non-existent (e.g. it has no paragraphs) we will also say no. If the book sentence structure is ‘unusual’ (most common when English is not the writer’s first language), we will reject the manuscript with the suggestion that further 'low level’ editorial work is applied before it is ready for a developmental edit. The second most common reason we say no to a book is that we don’t have the editorial experience for the genre. We pride ourselves on both having experience in editing and deep genre knowledge. We spend a lot of time talking to writers, publishers and agents and have a good understanding of what the current trends in the marketplace look like. This means that if your book is not within a genre in which we specialize, we are not the best people for the job. If you are not sure if we will accept your book’s genre, just email and ask. If I plan to write/submit more than one book, will I get the same editor? If you have had a book previously edited by BubbleCow, you will be offered the opportunity to have the same editor for your next book. However, if your book is of a different genre, we may well suggest that we assign a different editor, with better genre experience, to your manuscript. The choice will be yours and we will discuss this when your book is submitted. Can I pick my editor? At the point of submission, we will be in touch with you to discuss your book. At this point, you will have the chance to elect a certain editor. If we feel the editor is not ideal for your book, we will discuss this in detail and explain who we feel would be the best choice. Will you ship out my book to some anonymous freelance editor? We are a small team, with only a small group of full-time editors. This is the way we have designed the company. We feel that the connection between writer and editor is essential and that this can only be achieved when the writer is confident that the editor is committed to their project. We don’t hire freelance editors. The idea of short-term, transitory staff, is against the very core of the way we feel editing should be offered to writers. Instead, we focus on hiring long-term, dedicated and highly experienced book editors, that we can train and develop over time. Is there a minimum word count? We don’t accept books of fewer than 15,000 words. The reason is simple. Our secret power is in editing long-form manuscripts; in other words, novels and long non-fiction books. If your book is shorter than 15,000 words, we are probably not the best match for your project. I want to submit my book in small chunks. Is that possible? We have a minimum word count of 15,000 words. As long as you submit in chunks of this size or larger, then there’s no issue. In fact, we have had many authors take this approach in the past, and it always seems to work well. The key, from our viewpoint, is that you let us know that you will be submitting in chunks. This way we can ensure that you have the same editor for each submission. The only ‘problem’ with submitting in chunks is that it extends the overall time it will take to edit your book. One thing we can do to shorten this editing process is to ‘book’ in each chunk ahead of time. If you know that your next chunk will be ready at a set date, you can inform us of the date ahead of time, and we will be ready to start editing the moment you submit. Do you keep the copyright? We are simply a service. You pay us; we make your book better. At no point do we take ANY rights. ALL rights remain yours at all times. In fact, if you are considering using any editorial service that is suggesting that they will be taking any cut of your book’s copyright, or long-term sales, please run a mile. Once I have had the book edited, will the editor look at the changes? We tend not to offer a second ‘full’ edit. The reason for this is that we will note everything we can, which adds value to your book, during the first edit. A second edit is unlikely to produce significant additional value. The exception to this rule is if you have ‘significantly’ altered the book. In this situation, a second edit may well add enough value to allow an additional edit. If you feel this is the case, then we can have a discussion and provide a cost for the additional editorial feedback. What we can offer is the option for us to re-assess certain sections of your book. If our feedback has suggested specific changes and you have applied them, you might wish to consult the editor to discover if you are on the correct path. In this situation, you would resubmit the reworked section by email, and we would provide some feedback. This additional feedback would not be a developmental or line edit, but would, instead, just be an assessment of what you have written. There’s no charge for this additional work. If I get my book edited, will I still need a proofread? The line edit we offer is not a replacement for a professional proofread. The line edit will remove a significant number of errors, but it is not exhaustive. It is, instead, a tool that can be used to help prepare your book for the next stage. In addition, our developmental editing will stimulate some level of rewriting. Experience tells us that whenever we add in new material, there will be some level of errors also introduced (human nature and all that). This means that even if we were able to remove all errors in the line edit, you would still not be sure your manuscript was error free due to the rewrites.